Julius Thomas will step away from the NFL after seven seasons. The free agent tight end announced, via The Players’ Tribune, he intends to pursue a career in psychology and will be returning to school to pursue a doctorate degree. The Dolphins released Thomas earlier this year, and the 30-year-old pass-catcher will move on from the sport. He spent four seasons with the Broncos, two with the Jaguars and played his final year in Miami. “While making the decision to no longer play the game is difficult, I’m also incredibly excited about what’s next: Studying therapy and becoming well trained in it so that I can help people heal from their emotional and mental pain,” Thomas wrote. One of the best basketball-to-football conversion stories, the former fourth-round pick out of Portland State was one of the most sought-after free agents in the game in 2015. He signed a five-year deal worth more than $46MM with Jacksonville, doing so after two dominant seasons in Denver. Stationed as one of Peyton Manning‘s top targets, the former Division I-FCS talent caught 24 touchdown passes between the 2013 and ’14 seasons. He made the Pro Bowl both years and started in Super Bowl XLVIII. Thomas eclipsed Shannon Sharpe‘s franchise record for most touchdown grabs in a season by a tight end, hauling in 12 in back-to-back slates. While Thomas couldn’t replicate that production away from the future Hall of Fame passer, he totaled two more 40-reception seasons and played three years on that lucrative 2015 contract. However, injuries played a significant role in Thomas’ career. He missed 28 games during his four Broncos seasons and 11 during his two Jags campaigns. While Thomas surmounted his early-career maladies at the right time, just as Manning set NFL records on explosive offenses, the 6-foot-5 tight end was hobbled for much of his career. He intends to study the effects of CTE. 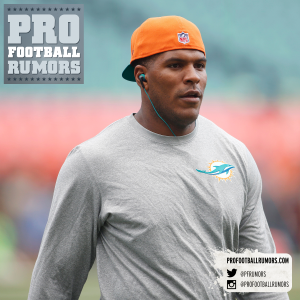 Julius Thomas will be back on the market after the Dolphins followed through with their decision to cut the former Pro Bowl tight end. The Dolphins will save $6.6MM as a result. 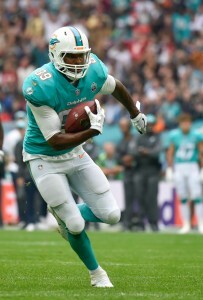 Thomas ended his first season with the Dolphins on injured reserve. Although the injury-prone Thomas played in 14 games in 2017, his most since 2013, he finished last season with just 41 catches for 388 yards. That marked an uptick from his final Jaguars season but nowhere near what was expected of the tight end when he was last in free agency. This continues a downward swoon for Thomas, who signed a massive five-year, $46MM contract with the Jaguars the last time he was an in-demand UFA three years ago. The two seasons the pass-catcher played with Peyton Manning in Denver now look like the outlier; the seven-year player just hasn’t been able to stay healthy. 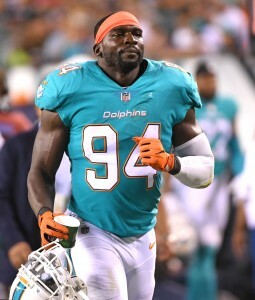 The Dolphins are planning to cut linebacker Lawrence Timmons and tight end Julius Thomas prior to the beginning of the new league year on March 14 to help relieve cap issues, per Armando Salguero of the Miami Herald. Salguero also speculates that the team may look to shed the fifth-year option for offensive tackle Ja’Wuan James, making him a free agent. In total, the move would save the Dolphins $21MM and would open up around $11MM in cap space. As it stands without the cuts, the Dolphins are projected to be $7MM-$8MM over a projected $177MM salary cap, with 55 players under contract. By cutting Thomas, the Dolphins would save $6.6MM in cap room and would save $5,5 MM by cutting Timmons. If they don’t pick up the option on James, that would save them $9.34MM. Salguero points out that $11MM in cap space may not be enough to make a major splash in free agency this offseason, considering what sources described to him as a shallow free agent pool that could lead to prices being driven up for top-level talent. Timmons signed a two-year, $12MM with the Dolphins last offseason. He appeared in 14 games (13 starts) and recorded 58 tackles, his lowest total since 2009. 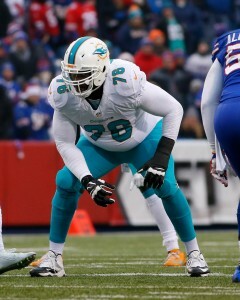 Thomas ended his first season with the Dolphins on injured reserve. The two-time Pro Bowler was set to enter the second season of a two-year, $12MM deal. James made eight starts at right tackle last season and has made 47 starts through the first four years of his career. The Dolphins may be in the market for an outside linebacker, with Koa Misi also due to hit free agency. Backup tight end Anthony Fasano is slated to become an unrestricted free agent this offseason as well. The Dolphins have placed tight end Julius Thomas and offensive lineman Jermon Bushrod on injured reserve. In related moves, they promoted tight end Thomas Duarte and activated offensive tackle Eric Smith off of injured reserve. The move means that Thomas and Bushrod will not be able to suit up for the team’s final two games against the Chiefs and Bills. This could also mean that the two players have played their final snaps for the Dolphins. Thomas is under contract with a $6.6MM cap number next year, but the team can get out of the entire obligation by releasing him. Bushrod, meanwhile, is eligible for unrestricted free agency in March. This year, Thomas had 41 catches for 388 yards and three touchdowns. It has been widely assumed that he’ll be released outright, but Armando Salguero of the Miami Herald recently suggested that Thomas could instead return at a reduced salary. Recent comments by coach Adam Gase also indicate that Thomas could have a future with the team. Mired in their worst season in 14 years, the Giants could soon be faced with a tough decision at quarterback. But for now, their plan isn’t changing. Eli Manning will continue to be their starter, and Davis Webb‘s role doesn’t look to be increasing. The Giants do not plan to play the third-round rookie in 2017, Ralph Vacchiano of SNY.tv reports. Webb has not been receiving additional practice reps and remains behind Manning and Geno Smith, the latter being expected to keep operating as the backup quarterback. Giants wide receivers coach Frank Cignetti said the Cal product is making “tremendous progress” and noted the team would “obviously” get a better read on Webb with game action, but the 1-8 Giants may have other plans in the works regarding their post-Manning quarterback. Webb was “all but anointed” as Manning’s successor come 2020, Vacchiano notes, but that was before the team lost eight of its first nine games. Now, the Giants have ramped up quarterback scouting, Vacchiano confirms, because of their lost season and a possible top-five draft choice that would then be awarded. The reporter adds Big Blue will “strongly consider” taking a quarterback with that pick. Here’s the latest from the Eastern divisions, continuing with the New York teams. Both the Giants and Jets have sent their GMs to Los Angeles on Saturday night for the UCLA-USC game featuring high-end quarterback prospects Sam Darnold and Josh Rosen. While Jerry Reese is heading the Giants’ contingent, per Rich Cimini of ESPN.com (on Twitter), Mike Maccagnan, VP of personnel Brian Heimerdinger and a scout are representing the Jets. Cimini adds Gang Green might be leading the pack among interested teams here. That’s interesting because, as of now, the Jets won’t be in position to have the kind of draft pick it will likely take to land Darnold or Rosen, provided they declare early. While it’s uncertain how many other GMs are at the Los Angeles Coliseum for UCLA-USC, at least 20 teams have sent scouts. The Jets are operating their quarterback contingent in similar fashion to their stadium mates, with Vacchiano reporting the team has no immediate plans to play Christian Hackenberg. Barring a Josh McCown injury, Vacchiano writes it’s unlikely Hackenberg plays this season. Additionally, the reporter notes the Jets “aren’t sold” on the 2016 second-round pick. Vacchiano reports the Jets are “strongly eyeing” the 2018 draft class as well. The Jets are believed to be scouting Wyoming’s Josh Allen to a degree other teams aren’t just yet. The Dolphins‘ pass-catching corps may look quite different next season. While Barry Jackson of the Miami Herald notes the team will have money to re-sign Jarvis Landry, the Dolphins are of the belief they can replace the slot receiver with a Day 2 draft pick. Landry is averaging 7.7 yards per reception, and that might not be worth a $16MM franchise tag for the team. Jackson reports Landry is expected to want a contract in the range of five years and $65MM — which would make him by far the NFL’s highest-paid slot receiver. Jackson writes no decision has been made on this front yet, and how this season finishes will influence the franchise’s thinking on this front. Miami wants Ndamukong Suh back for what will be his age-31 season but will likely approach the Pro Bowl defensive tackle about a restructure, Jackson notes. The Dolphins could create $12MM in 2018 cap space with a base salary-to-signing bonus conversion, thus putting more money on future caps, and lower Suh’s ’18 cap hit from $26.1MM to around $14MM. 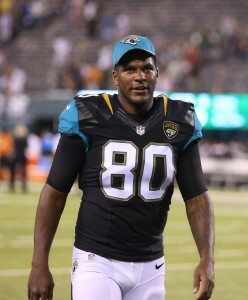 However, Jackson notes Julius Thomas probably won’t be back next season. The tight end has another season on his Jaguars-constructed (and Dolphins-restructured) deal, but Miami can save $6.6MM in cap space. The athletic pass-catcher who will turn 30 in June is on pace to play more than he did in either Jaguars season, having suited up for all nine Dolphins games thus far, but he has not been the same since leaving Denver. As the Chiefs were preparing to trade up 17 spots in the first round of this year’s draft to select Texas Tech quarterback Patrick Mahomes 10th overall, they reached out to starting signal-caller Alex Smith to make sure he’d be OK with it, general manager John Dorsey told the NFL Network on Monday (via Conor Orr of NFL.com). “You know, Alex is the consummate professional,” said Dorsey. “He’s been through these types of situations before and we made sure we communicated with Alex leading up to the draft that we may make a move like this. And when we were on the clock and traded up with Buffalo, we made sure we again got in contact with Alex and he’s all on board with this.” Even after the addition of Mahomes, Smith knows the Chiefs are “his team,” per Dorsey, who praised the 33-year-old for owning “the fourth-winningest record” among QBs since his KC tenure began in 2013. The Chiefs have indeed posted an excellent regular-season mark (41-20) with Smith at the controls, but they’ve managed only one playoff win in three trips. Now, thanks in no small part to the Chiefs’ investment in Mahomes, Smith appears unlikely to last as their starter for much longer. The 12-year veteran’s contract will expire after the 2018 season. The Ravens are the best fit for free agent running back LeGarrette Blount, opines ESPN.com’s Jamison Hensley, who writes that the ex-Patriot’s “bruising” style would be perfect for Baltimore’s offense. Moreover, running back is a need for the Ravens, Hensley points out. With Kenneth Dixon set to miss the opening quarter of the season on account of a suspension and Terrance West having led the team last year with a so-so 774 yards on 193 carries, it’s hard to argue with Hensley. PFR’s Zach Links recently made a case for Baltimore to sign Blount, who set a career high with 1,161 rushing yards and finished with an NFL-best 18 touchdowns on the ground last season. The Titans are likely to promote Jon Salge to director of college scouting, a source told ESPN’s Adam Caplan (Twitter link). Salge, a college scout who’s in his 11th year with the Titans, would replace the recently fired Blake Beddingfield. Here are some notes from around the league on the final Sunday before the Scouting Combine. Ryan O’Halloran of the Florida Times-Union examines a few reasons why the recently traded Julius Thomas did not meet expectations with the Jaguars. Citing a league source, O’Halloran says that Thomas’ Jacksonville tenure was marred by the fact that he did not make enough downfield catches, that he did not create enough yards after the catch, and that he performed poorly as a blocker. Still, O’Halloran believes the Jags should not have dealt Thomas, as he says they are not in position to part with talented players, regardless of their flaws. The Saints have expressed their desire to bolster their pass rush this offseason, and Larry Holder of the Times-Picayune notes that New Orleans, for the first time in a while, has money to spend in free agency. Holder adds that New Orleans would probably be willing to make a splash for a big-name pass rusher like Melvin Ingram, though if Ingram gets the franchise tag from the Chargers, or if his price becomes too rich for the Saints’ liking, Holder points to Nick Perry as a quality alternative. Without a similar deep-threat playmaker on the team, James Walker of ESPN.com wonders why the Dolphins would potentially allow Kenny Stills to depart as a free agent. One of the top wideouts who stand to be available this year, Stills has drawn interest from the receiver-needy Eagles and wouldn’t mind moving to the west coast. The former Oklahoma Sooner is an Oceanside, Calif., native. While the Dolphins have reportedly attempted to prioritize Stills, it’s clear they will have competition if he reaches the market. The NFL rule that keeps incoming draft picks with certain types of past off-field misconduct away from all league-sponsored events — like the Scouting Combine — is coming under increased scrutiny, as Mike Florio of Pro Football Talk writes. Florio observes that teams will evaluate all players regardless of whether they are invited to the Combine, but they nonetheless prefer that the players be available in one place at the same time. As such, the competition committee could address the issue later this year, either by modifying the current rule or by scrapping it entirely, and any changes could be effective as soon as 2018. Tony Pauline of DraftAnalyst.com believes that as many as three guards could go in the first round of this year’s draft, with Pittsburgh’s Dorian Johnson, Indiana’s Dan Feeney, and Western Kentucky’s Forrest Lamp all looking like players that could be among the top 32 selected. Pauline notes that the offensive line as a unit is probably the weakest area of the draft, which means that some of the higher-rated prospects — like Lamp, whom Pauline does not believe is worthy of a first-round selection — and even those with middle-round grades will be overdrafted. All deals are contingent on players passing a physical exam, but it is often just a formality. In the case of tight end Julius Thomas, who has missed eleven games in the past two years, the physical was nothing to be scoffed at. On Tuesday, Thomas was given a clean bill of health by doctors, paving the way for a deal to be finalized between the Jaguars and Dolphins on the first day of the league year, Armando Salguero of the Miami Herald writes. Teams cannot officially make trades until March 9, but everything is now in place for the swap to go through. The intra-state deal will send the tight end to Miami in exchange for a 2017 seventh-round pick. Then, in a separate deal, left tackle Branden Albert will go to Jacksonville in exchange for a 2018 seventh-round pick. Initially, it looked like the veterans would be exchanged within the same trade. Effectively, of course, they are being traded for one another. Thomas has a history with Dolphins head coach Adam Gase and he is expected to pick up the offense rather quickly. If he can stay healthy, he could prove to be a serious weapon for Miami. Between 2013 and 2014, Thomas tallied 108 catches and 24 touchdowns under Gase’s guidance. Meanwhile, the Jaguars have secured their replacement for left tackle Kelvin Beachum, though Albert comes with plenty of question marks himself. The Dolphins have agreed to acquire tight end Julius Thomas from the Jaguars, reports Armando Salguero of the Miami Herald. The Fins will send a 2017 seventh-round pick to Jacksonville for Thomas, who is traveling to Miami tomorrow for a visit and physical, per Ian Rapoport of NFL.com (Twitter links). The trade won’t become official until 4 p.m. ET on March 9, the start of the 2017 league year. It’s no surprise that Thomas will head to Miami, which worked hard to acquire him in recent days, but the club took an unusual route to land the 28-year-old. It looked as though the Dolphins and Jaguars were set to swap left tackle Branden Albert and Thomas over the weekend, but that fell through early Monday. Jacksonville later agreed to acquire Albert in a separate deal, which the teams haven’t yet finalized. Thomas had drawn trade interest from other teams, but the ex-Denver star will now reunite with Dolphins head coach and former Broncos offensive coordinator Adam Gase. Thomas is eager to reunite with Gase, per Salguero, which is hardly a shock. From 2013-14, Gase was at the helm of a Denver attack that prominently featured Thomas, who posted the best seasons of his career during that stretch. Thomas combined for 108 catches and 24 touchdowns under Gase, and he parlayed that success into a mega-deal with the Jaguars in 2015. Thomas didn’t live up to his five-year, $46MM contract in Jacksonville, where he missed 11 of 32 regular-season games and saw his yards per catch drop from nearly 12.0 in Denver to under 10.0. He was fairly productive otherwise, though, as he caught 76 passes and nine scores in his 21 appearances as a Jag. As was the case in Denver and Jacksonville, Thomas will serve as Miami’s top tight end. The club seems likely to lose its No. 1 option from last season, soon-to-be free agent Dion Sims, which made finding a replacement a high priority. Thomas is under contract through 2019, but he has agreed to restructured his deal, a league source told Salguero. The Dolphins are “significantly” cutting down his remaining cap hits, which previously ranged from $8.3MM to $10.3MM. Thomas will have a chance to earn back the money he’s losing through incentives. The possibility of the Dolphins acquiring Jaguars tight end Julius Thomas for left tackle Branden Albert is now off the table, reports Armando Salguero of the Miami Herald. However, the Dolphins have agreed to send Albert to the Jags in a separate deal, per Salugero, which will net Miami a 2018 seventh-round pick, tweets Albert Breer of The MMQB.com. In order for the trade to become official, the Jaguars will need Albert to agree to report, according to Salguero. Before that happens, the Jags and Albert’s representation will continue discussing his contract status. Albert himself will have dinner tonight with Jacksonville’s front office, per Ian Rapoport of NFL.com (Twitter link), who adds the two sides will discuss his deal on Tuesday if all goes well. The two sides have been in talks regarding Albert’s deal the past “several days,” writes Salguero, who adds that Jacksonville seems prepared to take on the rest of his pact and possibly even extend it. The 32-year-old Albert is currently signed through 2018 and set to count upward of $10MM against the salary cap in both seasons. By moving on from Albert, the Dolphins would free up $7.2MM in spending room. As for Thomas, he could still end up with the Dolphins, tweets Rapoport, but their efforts to acquire him have hit a snag over his contract. Thomas reportedly would have had to take a pay cut had the Jaguars sent him to the Dolphins for Albert. The 28-year-old is signed through 2019 and comes with pricey base salaries ($7MM, $8.5MM and $9MM) and cap hits ($8.3MM, $9.8MM, $10.3MM). Nearly half of his salary for 2017 ($3MM) has already become guaranteed.